Say Malta and what springs to mind? The Knights of St John, the Maltese Falcon and the award of the George Cross – signifying dignity and magnificence, chivalry and fortitude. But that is history. Move forward and Malta has developed into a modern, wealthy democracy with tourism as the mainstay of the economy in the main island of Malta itself and in the sister islands of Gozo and Comino. These three islands together with other tiny uninhabited islands make up the Malta archipelago located at the heart of the Mediterranean Sea. 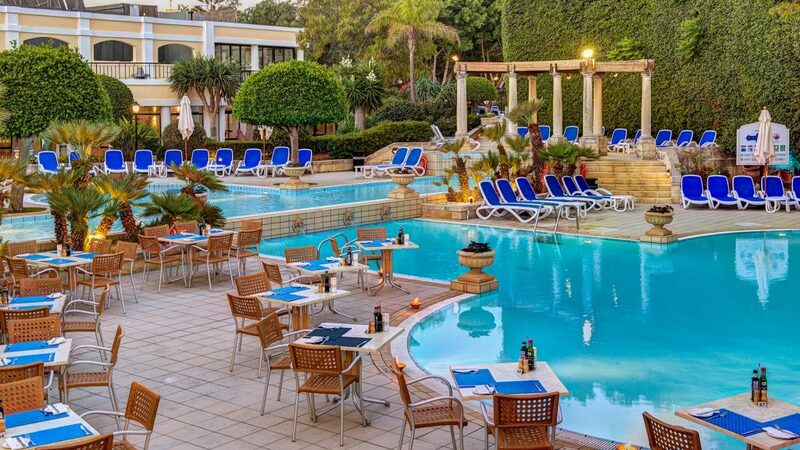 Perfect for holidaying Malta is sun drenched with over 6,000 years of history. The islands have a wealth of treasures, including three UNESCO World Heritage sites. Everywhere you go there is something to see, from unique prehistoric temples, splendid Baroque architecture and remarkable fortifications to vast harbours and perfect seascapes. The islands offers Mediterranean living at its very best being an all-year round destination with infinite possibilities for leisure. 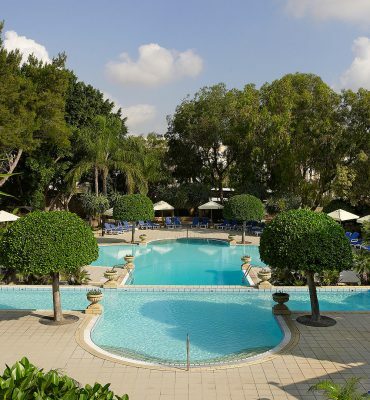 Situated in the centre of the main island of Malta is the Corinthia Palace Hotel and Spa which is an oasis of calm and luxury. This is the spiritual home of the Corinthia Hotels group being their very first hotel. 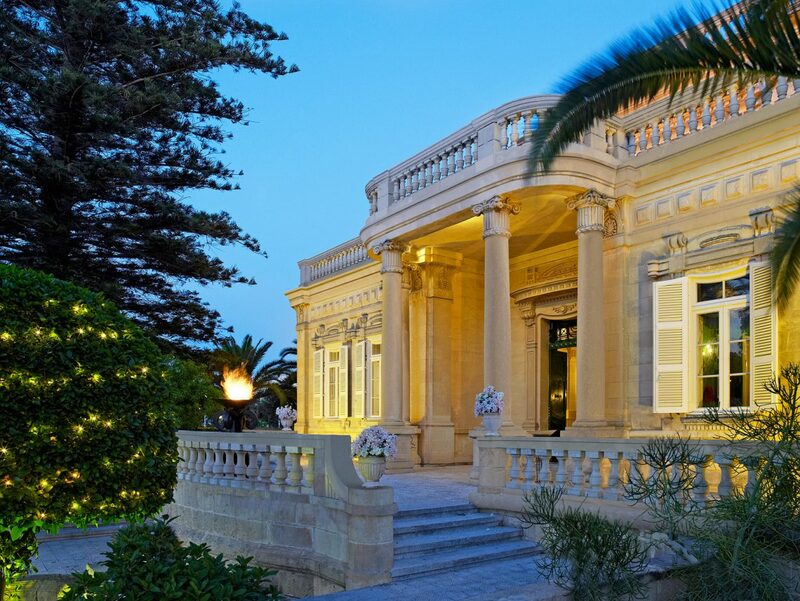 The Corinthia Group celebrated their 50th anniversary in December 2012. 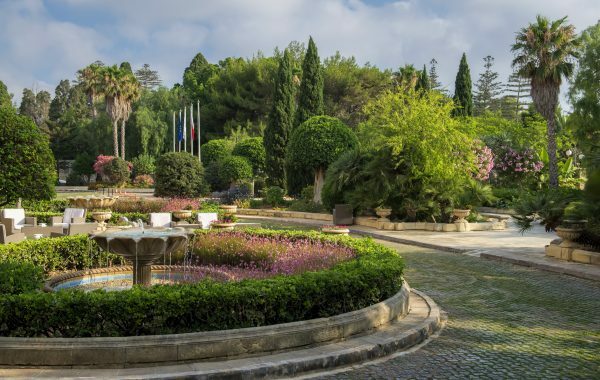 The Corinthia Palace Hotel built in the grounds of a graceful villa that exudes old world charm combined with contemporary comfort. 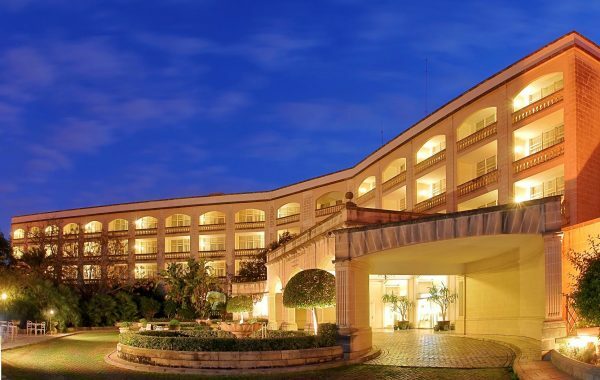 The Corinthia Palace Hotel is a short distance by car, public transport or by using the Hotel’s courtesy bus, from the Islands main sights and attractions, including the elegant capital Valletta. 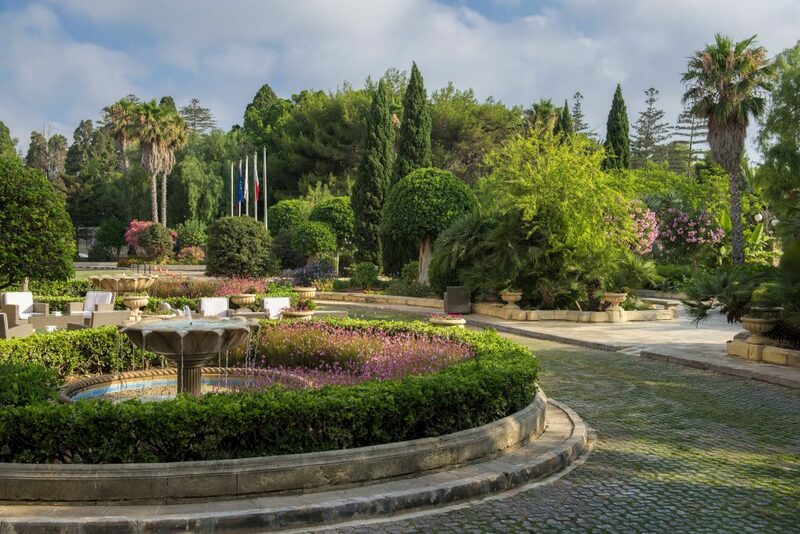 Indeed things to see start on the doorstep with the nearby San Anton Gardens which contains the 17th century Presidential palace and botanical delights. 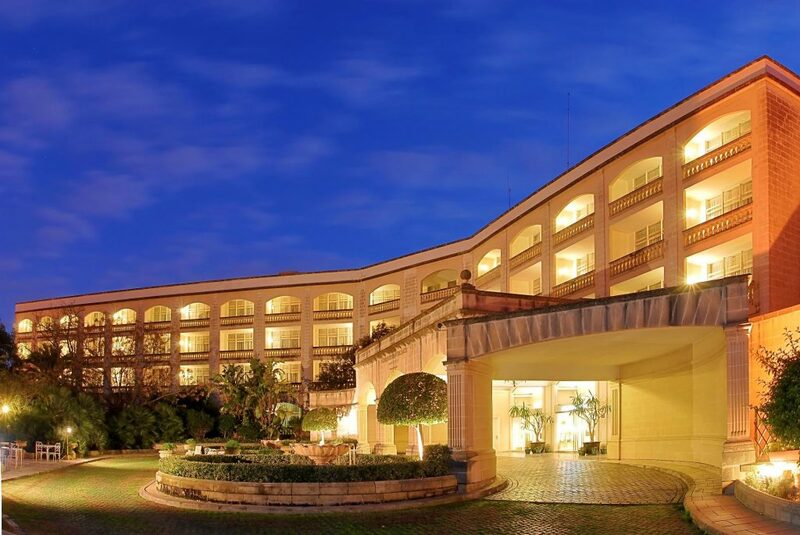 The Corinthia Palace Hotel has won many international awards including winning again the 2012 World Travel Award. The level of service that can only be described as perfect from the dedicated staff who from the moment you enter the Corinthia Palace Hotel are proud to serve the guests and equally proud to be part of the Corinthia “family”. Approaching the Corinthia Palace Hotel Her Ladyship and I were impressed by the splendid gardens which in addition to an attractive outside seating area has striking view of the original villa. The Lobby is welcoming and yet gives an air of peace and calm with comfortable seating to one side for relaxed conversation or just waiting. 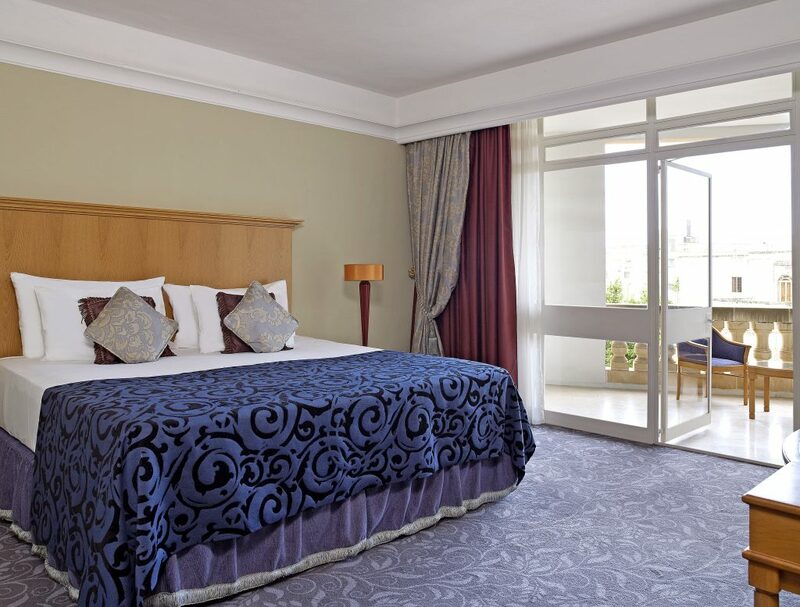 Immediately the aim of the Corinthia Hotels to provide comfort and service is evident. The commitment to a high level of service is shown by Curran, the incredibly efficient Front of House Manager and Emmanuel, the very knowledgeable Concierge. Both of these excellent and efficient staff members went out of their way to welcome Her Ladyship and I, also to help us in any way they could. 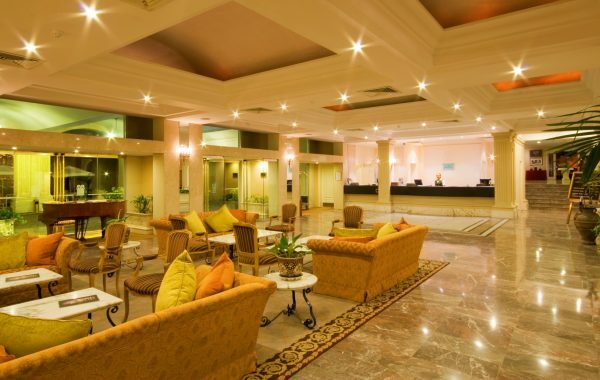 Nearby is a bar, handy to quench that thirst with chilled champagne, also a delightful area for that tête-à-tête meeting or light refreshments, including full afternoon tea and breakfast for those in a rush. 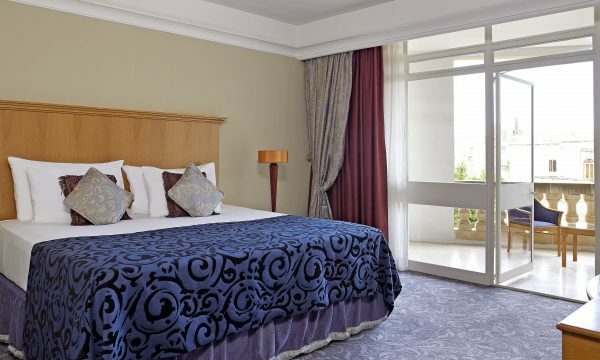 Her ladyship and I were guided with courtesy and friendliness to our superior room, which was furnished elegantly in keeping with the ambiance of the Corinthia Palace Hotel. The beds had luxurious crisp white linen sheets, with comfortable pillows and the nice touch of slippers and robes. We had a lovely balcony overlooking the gardens which was extremely pleasant as we could enjoy the view and the warm afternoon sun. The en-suite bathroom was a good size with all the usual fixtures and fittings, with toiletries and fresh white fluffy towels. The room had more than enough storage and wardrobe space, the room also had the great traveller’s need of wi-fi, phone and a television. Eager to explore we found our way around the Corinthia Palace Hotel and all it has to offer. There is wide dining choice from the graceful and historic Corinthia Room which has been lavishly created in the original villa to The Rickshaw restaurant serving Asia-Fusion cuisine in harmonised surroundings. There is also the Caprice Lounge which provides a relaxed, stylish gentleman’s club like bar with an attractive style that complements the elegance of the Corinthia Palace Hotel, here one can enjoy an aperitif before going to dine. 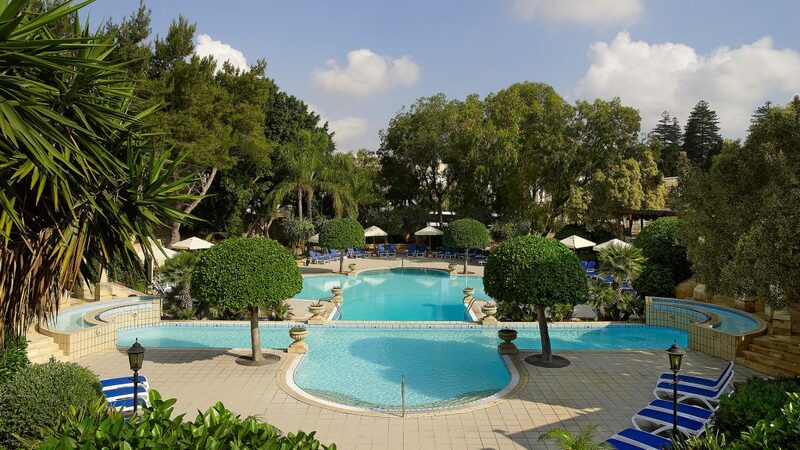 The neat well-stocked gardens and grounds of the Corinthia Palace Hotel contain further dining options, bars and two stunning pools where you can relax, enjoy the sun or take gentle exercise. The Athenaeum Spa can also be found nearby offering a wide range of treatments together with a fully equipped fitness room and indoor pool, this was one place the Lady decided she was going to frequent later. We stayed by the pool enjoying the sun and found the intelligent idea of “Tweeting” from your sun lounger your drinks and food order. Being a fan of this Twitter malarky I just had to try this, saves time getting ones G&T all all. That night after dinner at The Rickshaw restaurant we retired to our room. We found the beds were the most comfortable known in this world where we had a wonderful night’s sleep in the land of dreams. ​Her Ladyship and I were pleased that blackout curtains are fitted to the bedrooms to keep out the bright morning light before one is ready to surface. All too soon the morning arrived but not to be down hearted Her Ladyship and I knew we would have a wonderful day at the Corinthia Palace Hotel. We headed for Breakfast with the widest choice available, served in a dedicated restaurant located on the first floor of the original villa. When it came to our departure from the Corinthia Palace Hotel it was like old friends leaving. The staff were as always helpful, courteous and genuinely sorry to see us and any guest leave. Her ladyship and I were reluctant to depart, this gem on the island of Malta. 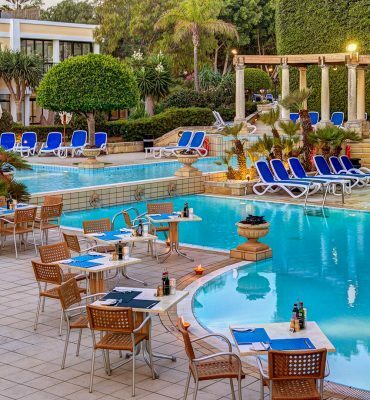 The Corinthia Palace Hotel and Spa is where to stay in Malta if you want to enjoy the level of service and comfort that should be standard for all. In this modern high speed world the Corinthia Palace Hotel and Spa is the bench mark against which it will be difficult to match for charm and elegance.